It's fascinating to watch Jesus woo the disciples (who were not yet disciples) in this passage. His popularity with the crowd needed a bit of a stage that provided both visibility and distance. A boat would be just the thing. He chose Simon's (Peter's), asked him to interrupt his net-washing and "put out a little from the land" and taught the crowds from there. Imagine being the one from whom this upstart asked such a favor. I wonder, did Peter feel annoyed that Jesus just commandeered his boat for several hours, or honored and flattered? It didn't end there, though. 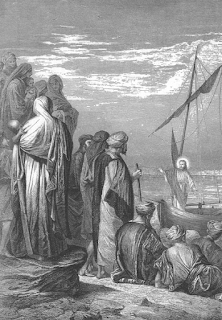 After the teaching session, Jesus turned His attention from the crowds to the boat owner. He told Peter to move to deep water and start fishing. Peter, probably still smarting from the previous unsuccessful night, started to argue but then changed his mind and did as Jesus said. A great miraculous catch followed. "They" (Peter and probably his brother Andrew) got help from partners James and John to haul in the multitudes of fish. At Jesus' next words "'Do not be afraid. From now on you will catch men,'" Peter was completely smitten. He (and his partners) "...brought their boats to land, they forsook all and followed Him" - Luke 5:11. I would love to have interviewed Peter and asked him, what was going on in his mind and heart that synchronized with Jesus' actions and words to cause this life change in him. Perhaps he was wondering how he could continue looking after his family's needs with such unpredictable fishing luck. Jesus had just showed him His supernatural power in that department. Perhaps he'd been wishing, all his life, to live for something bigger and had for some time been questioning the usefulness of what he was doing. Jesus told him he would "catch men." Peter may not have completely understood, but would surely have been intrigued. We don't know. But we do know that on that particular day in Peter's life, Jesus ticked all the boxes and the decision to follow Him was easy. On listening to people's stories of how they come to Jesus, I've noticed something similar. Jesus woos us in different ways. Sometimes it's through unaccountable blessing. Sometimes it's via an inner search for more purpose and meaning. Sometimes Jesus is the last option to stop a downward spiral that, if something doesn't change, will lead to destruction. Let's pray for friends, colleagues, and loved ones who have yet to meet Jesus, that He will continue to work His wooing ways in their lives and that they will respond like Peter did. PRAYER: Dear Jesus, I see how You won Peter and his crew over in a few well-timed interventions and actions. Please continue to work that way in the lives of my loved ones who don't know You. Amen.